(TibetanReview.net, Aug20, 2016) – Apparently concerned that a large gathering of Tibetans may use the occasion as an opportunity for protest, Chinese authorities have banned the holding of an annual 10-day religious festival at the famed Larung Gar Buddhist Academy in Serta (Chinese: Seda) County of Karze (Ganzi) Prefecture, Sichuan Province, in view of the ongoing forced massive demolition being carried out there, reported the Tibetan Service of Radio Free Asia (Washington) Aug 16. The report did not give the name of the annual religious festival but said it was meant to dispel obstacles. 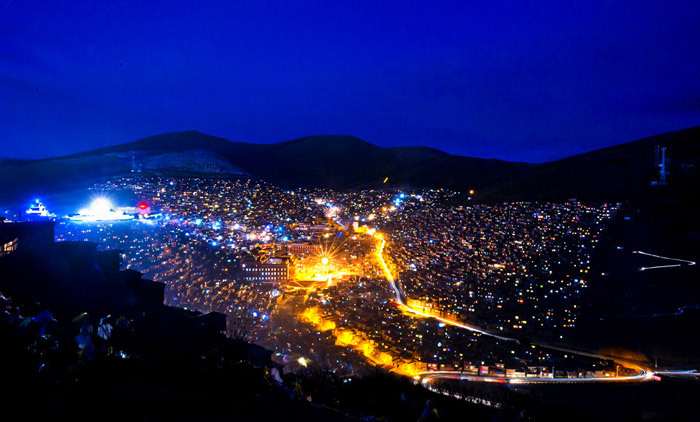 It only said the festival of religious ceremonies was moved to the nearby Shoru Monastery, an affiliate of the Larung Gar Academy, and was allowed to be held for just one day, on Aug 15, under stringent conditions. One of the conditions was that monks and nuns who went to attend the rituals at Shoru Monastery had to return to Larung Gar as soon as the ceremonies ended. Under orders from Beijing, China has been carrying out massive demolition at the sprawling institute, which is otherwise probably the world largest centre for the study of Tibetan Buddhism, with the aim to halve its size and its student-population to a maximum of 5,000. Following warnings of severe consequences, the leadership of the academy had asked its monks and nuns not to protest against the demolition. And on the day the demolition began, on Jul 20, a young nun committed suicide, unable to bear the agony of the destruction.